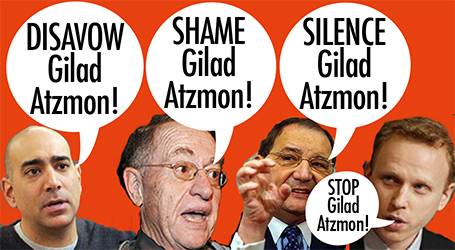 Introduction by Gilad Atzmon: five weeks after the publication of the unfortunate call to disavow me, support keeps flooding in. The following is Greg Felton's deconstruction of the statement (largely associated with Ali Abunimah). Greg is one of my favorite writers, his books: The Host and The Parasite and Exploding Middle East Myths: 15 Years of Fighting Zionist Propaganda are both must read. For some time now, I have been trying to get in touch with Ali Abunimah to ask him to explain his denunciation of Gilad Atzmon. I am used to Palestinian activists, Arab or non-Arab, attacking each other over this or that political or doctrinal difference, but this attack is worse than most. Abunimah has been in the forefront of the anti-Zionist movement for years, and over that time has built a considerable reputation. His website, electronicintifada.net, is still an outstanding source for non-zionist (read: uncensored) news about the Occupation. Consequently, his denunciation of Atzmon was guaranteed to be influential and reach a large audience, thereby maximizing the potential damage to Atzmon’s reputation and scholarship. The effect of the attack, though, has been suitably ironic. Rather than harm Atzmon’s reputation, Abunimah has elevated it beyond anything Atzmon could have done by himself. Outpourings of support have come from prominent activists like Kim Petersen, Alison Weir, Kevin Barrett, Mark Glenn, and Prof. Norton Mezvinsky. If Abunimah wanted to limit the reach of Atzmon’s arguments, he should have kept quiet and just let the hasbarats do what they do best. What puzzles me is the manner of the attack less than the attack itself. For instance, why did Abunimah denounce Atzmon so maliciously, and did he seriously think he could escape condemnation? I wanted to put these and other questions to this champion of Palestine, but in the absence of co-operation I have had to come up with my own answers. The implication here is that Gilad Atzmon is not a Palestinian solidarity activist or an ally of the Palestinian people. In fact, Abunimah deems him to be an enemy of Palestine and tries to excommunicate Atzmon from the community of Palestinian activists. How is this constructive?! Whether or not Abunimah wants to admit it, Atzmon and he are on the same side, but such dogmatic hostility suggests strongly that the motive for the attack goes deeper than a squabble over activist orthodoxy. Abunimah provides no evidence to substantiate either the claim of vicious attacks or obsession. Could one argue that Abunimah is obsessed with Palestine? No. I refer only to third category Jewish politics; hence, I do not talk about all Jewish politics. • Those who put their “Jewishness” above all other traits. The idea of political tribalism clearly does not apply to the first two categories, so Abunimah’s charge against Atzmon is without merit. It is a settler project but not colonial for there is no Jewish mother state. Because Israel claims to be a Jewish state, and admits that it persecutes Palestinians as a matter of national policy, it is expected, even necessary, for all things Jewish to come in for criticism. This is especially true of the Holocaust®, the founding myth of the zionist entity. For example, the number “six million” in connection with mass violence against Jews predates the Holocaust® by a quarter century. On Oct. 31, 1919, the American Hebrew published “The Crucifixion of Jews Must Stop,” a blithering screed by former New York Governor Martin H Glynn that began: “From across the sea, six million men and women call to us for help, and eight hundred thousand little children cry for bread.” The number “six million” is repeated four times! Further instances of this number appear in the New York Times (July 20, 1921, p.2; Feb. 17, 1945, p.8; Jan. 9, 1938 p. 12; and Jan. 8, 1945, p.17). Does Abunimah believe that anyone who denies the absolute, dogmatic facticity of “six million” is a Holocaust® denier? If he does, that makes him a zionist, not Atzmon. Finally, of the 10 paragraphs, only three actually mention Atzmon by name. The majority of the atttack is devoted to Marxist-sounding slogans, boasts of the morality of the Palestinian cause, and congratulatory backslapping for anti-Atzmon activists. This imbalance leads me to conclude that the attack wasn’t really about Atzmon at all; rather, it seems that Abunimah wanted to boost his own image at Atzmon’s expense. This view explains why he put no effort into being accurate. Why Abunimah would jeopardize his reputation so recklessly is unclear, but in the absence of a definitive response from him, I have to conclude that he felt personally and politically threatened. Unlike Abunimah, Atzmon does not buy into the cult of Jewish victimhood or allow “Jewish sensitivities” to limit the boundaries of acceptable political discourse. Abunimah accepts Jews, Jewish history and Jewish culture as given and treats themwith kid gloves, but in Atzmon’s hands they are shorn of all moral privilege and subjected to searing, honest criticism. The Wandering Who is an unsparing psychological analysis of the Jewish mind and the sociopathic zionist state. It is essentially a rebuke to the inhibitory “reasonableness” that makes official Palestinian positions more like collaboration than liberation. Abunimah went berserk on Atzmon because he saw in him the kind of honesty that, as a representative of Palestinian officialdom, he is unable or unwilling to articulate.